The Swedish designer, Janet A. Fernandez, is the artist behind J.A. Design Studio. Born in Landskrona, Sweden, Janet moved to Rome, where she lived for over 20 years. In Italy, she studied design and started her career as an interior designer. Much of the inspiration for her work comes from her Swedish heritage and Italian background. 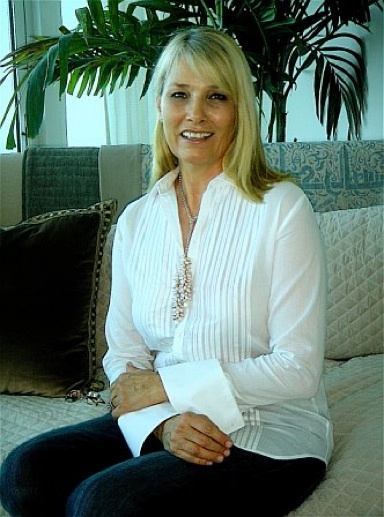 As an interior designer, Janet likes to mix modern with classic and to incorporate clean lines with antique detailing. In 1995, she moved to Miami, where she expanded her clientele as both an artist and an interior designer. In 2000, Janet developed her line of hand-painted and designed tablecloths and textiles. Today, Janet is busy with her company, J.A. Design Studio, and her expanding line of custom-made textiles. J.A. Design Studio is currently located in Miami, Florida, but is carried in several stores around the country. J.A. Design Studio specializes in designed, hand-painted tablecloths and textiles custom-made to fit the clients’ needs. The material used for the tablecloths and textiles is mainly linen, but we also use silks, cottons, and velvets. At J.A. Design Studio we know the importance of quality and use only the finest linens and silks; our linens are 100% European linen and our silks are 100% silk taffeta. The uniqueness of our tablecloths and textiles comes from their high-end design and artistry. All of our work is custom-made and selected from our library of patterns and colors, often inspired by classical designs, which makes it unique. Some of our work includes tablecloths, napkins, place mats, cushions, curtain panels, wall coverings, and throws. Our textiles can be sold by the yard as well. Pricing for all our hand-painted textiles, including the tablecloths, depends on the complexity of the pattern and design.